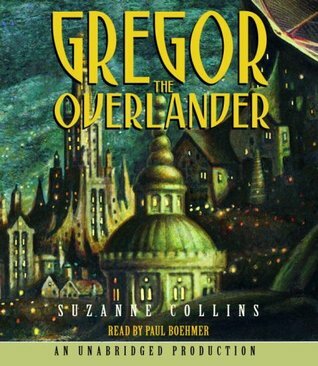 Gregor the Overlander, by Suzanne Collins, is a Middle Grade fantasy that draws on some typical fantasy tropes. Gregor is looking after his little sister and when she goes through a grate in the laundry room of their New York apartment building, Gregor goes after her. What Gregor finds beneath the apartment and the city is a world of giant, mutant spiders and roaches and bats and rats. These creatures have their own societal hierarchy and their own battles. Gregor (and his simple sister) become drawn into a conflict in which, he Gregor the Overlander (from the ‘above’ ground) is held in high esteem – based on a prophecy – in the Underland. He just wants to go home and the Underlanders just want to keep him where he is. Everything about this book felt incredibly familiar, but that is due to the fact that it draws on so many fantasy ideas. Talking insects, a land under the earth, prophecy, etc. Author Suzanne Collins keeps the story moving swiftly, and, for the CD/Audible version, Paul Boehmer adds some nice excitement in the telling, but this still feels like a fairly flat fantasy. Perhaps, for those young readers for whom this is their first foray into fantasy, it’s a nice vehicle, but I would otherwise not recommend this. Looking for a good book? Gregor the Overland by Suzanne Collins is a good first fantasy for younger readers, but relies on some over-used ideas to create a simple story.